Microsoft Toolkit 2.6.6 (also know as EZ-Activator) is a set of tools created by CODYQX4, and originally made available via the mydigitallife.com forums. 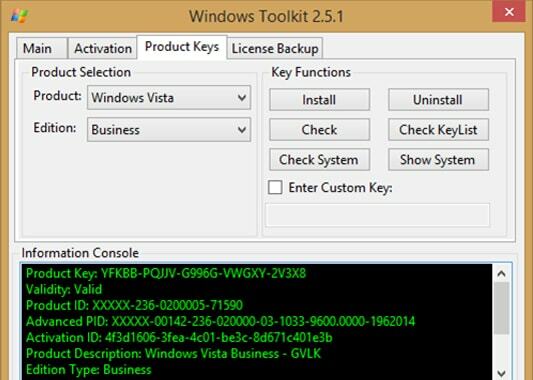 Microsoft Toolkit was created to allow easy activation of all Microsoft Windows (Windows 10, Windows 8.1, Windows 8, Windows 7) and Microsoft Office (Office 2003, Office 2007, Office 2010, Office 2013, Office 2016) products via a process called KMS. “KMS” (Key Management Service) is a technology developed by Microsoft that provides large corporations with the ability to license products such as Windows and Office in bulk. Microsoft Toolkit mimiks this technology by creating an emulated instance of a KMS server on your machine, answering the activation requests of your Windows / Office installation by providing it with a pre-generated volume license key. Every 90 days a request is made to the KMS server by your installed Microsoft products, so it is important for Microsoft Toolkit to be continually running as a service on your machine to answer these requests. To put it simply. Once you have downloaded and executed Microsoft Toolkit, your Microsoft Office and Windows products will be fully activated and able to receive official Microsoft updates in the same way as a fully licensed copy. So why not Download Microsoft Toolkit for Windows 8.1, 8, 7 and 10 from the Official Microsoft Toolkit website now? It should be noted that this software is only for personal testing purposes and we do not endorse its use for piracy. OfficialMSToolkit.com and the Microsoft Toolkit application are in no way related to, operated or owned by Microsoft Corporation. www.officialmstoolkit.com is the official website for downloading clean and original versions of the Microsoft Toolkit software. Other sites such as freemicrosofttoolkit.com and microsoft-toolkit.com have virus infected versions of our software that should not be downloaded! Microsoft Toolkit version 2.6.6 is the latest version of Microsoft Toolkit as of 20/Aug/2017 - any website reporting to offer newer versions than this are also fakes.